Join Centre for Print and Media Art at Workers Arts & Heritage Centre for the launch of Personal Narratives, a community art exhibition showcasing the work of artists from the NuLinks program. 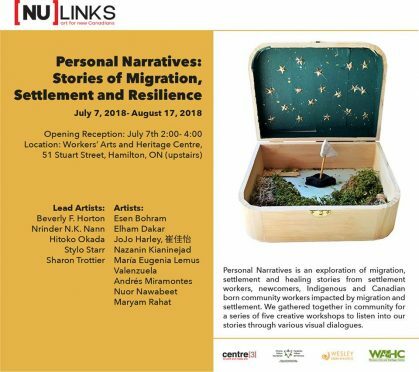 Personal Narratives is an exploration of settlement, migration and healing stories from settlement workers, newcomers, Indigenous and Canadian-born community workers impacted by migration and settlement. We gathered together in community for a series of five creative workshops to listen into our stories through various visual dialogues. Lead Artists include Nrinder N.K. Nann, Stylo Starr, Hitoko Okada, Beverly F. Horton and Sharon Trottier. Community Artists include Esen Bohram, Elham Dakar, JoJo Harley 崔佳怡, Nazanin Kianinejad, María Eugenia Lemus Valenzuela, Andrés Miramontes, Nuor Nawabeet and Maryam Rahat. Opening Reception: Saturday, July 7th from 2 – 4 pm in WAHC’s Community Gallery. Refreshments will be served. For more information, contact Tara Bursey, Program Coordinator, Workers Arts & Heritage Centre at (905) 522-3003 ex. 29 or tara@wahc-museum.ca. [Nu]Links art program is a partnership between Wesley Urban Ministries and Centre for Print and Media Arts, and was supported by the Ontario Trillium Foundation.